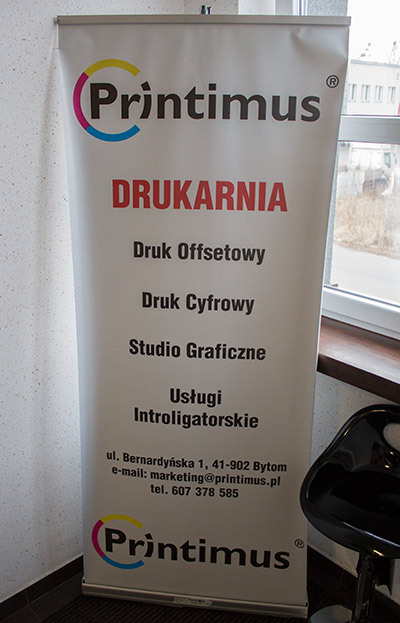 Location: Printimus Pinball, Bytom ul. Bernardyńska 1, Poland. 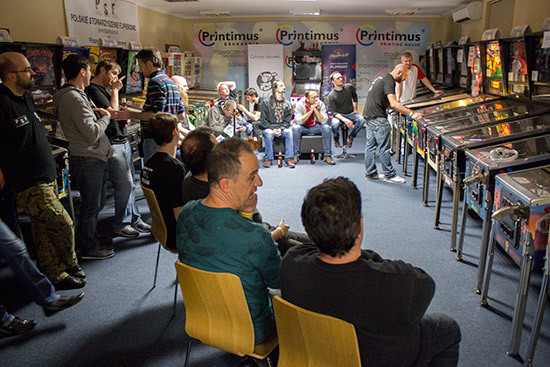 For the second year running, the IFPA European Championship Series (ECS) ran across the preceding twelve months. Participating countries could nominate one event from their 2015 tournament schedule, and all WPPR points earned at that event contributed to players' ECS 2015 points total. The thirty-two players with the highest ECS points total at the end of the calendar year then automatically qualified for the final, which is held early the following year. If some couldn't make it to the final, lower-ranked players filled the gaps until the field was complete. 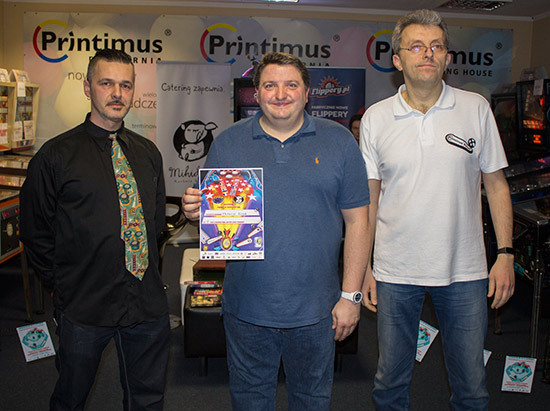 After last year's event at PinballEd in Switzerland, Printimus Pinball in Bytom, Poland stepped up to host the 2015 ECS final in late February 2016, combining it with another major tournament and a number of side events. 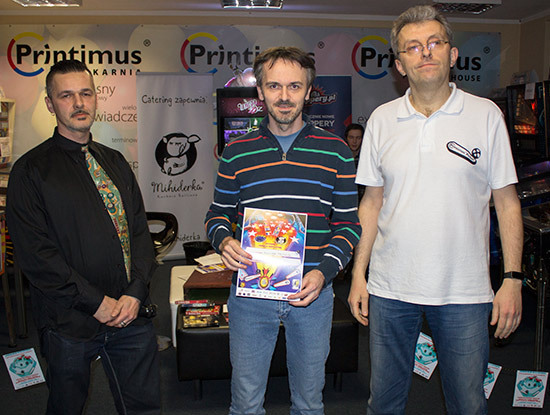 Regular readers will be familiar with Printimus Pinball. 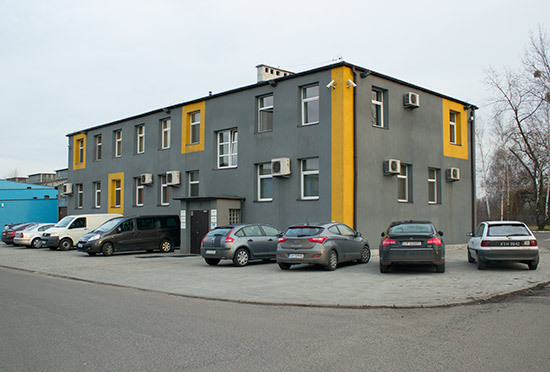 It was set up by Marcin Krysiński on the upper floor of his printing business on the outskirts of Bytom in Silesia, in the south of the country. 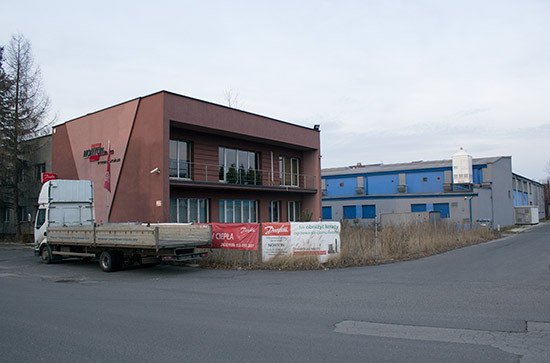 The building is on a light-industrial estate around a 15-minute walk from the city centre. Although the ECS final was limited to the 32 top-ranked players who could attend, the other tournaments were open to everyone. 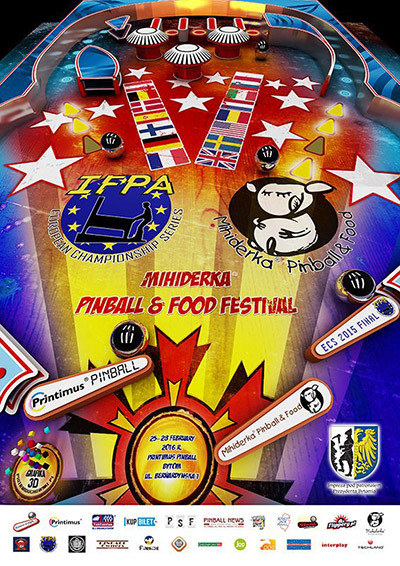 The ECS pinball action was also combined with the Mihiderka Pinball & Food Festival. 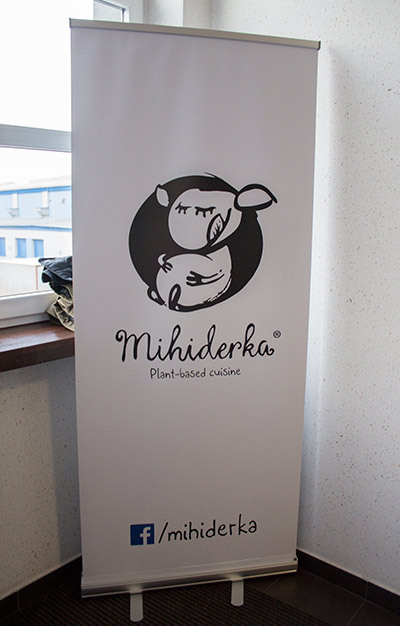 Mihiderka is Marcin's family's vegan restaurant business, and the €135 entry fee for all the tournaments included vegan food provided all across the three-day event. 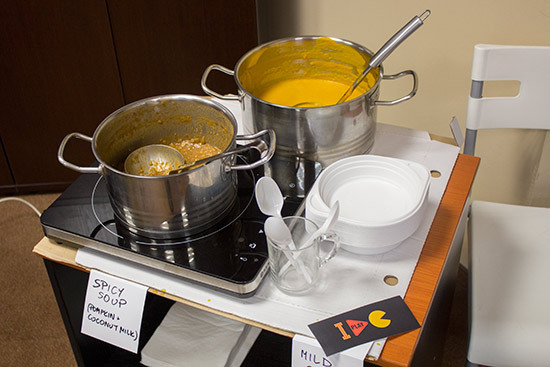 Some players broke ranks and headed into the city for McDonalds, KFC, or other meat-based meals, but most enjoyed and appreciated the care and skill put into these meals. 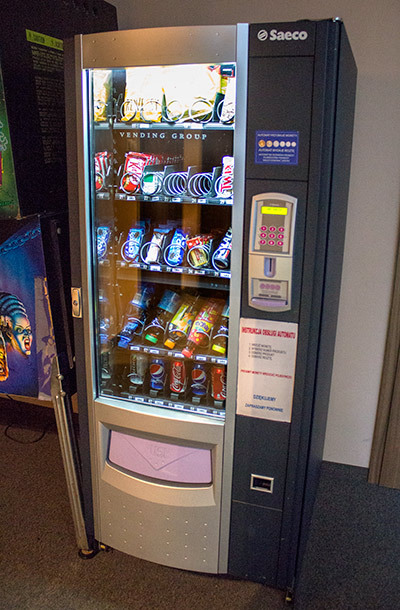 For those in need of non-vegan snacks, the vending machine provided a little relief. 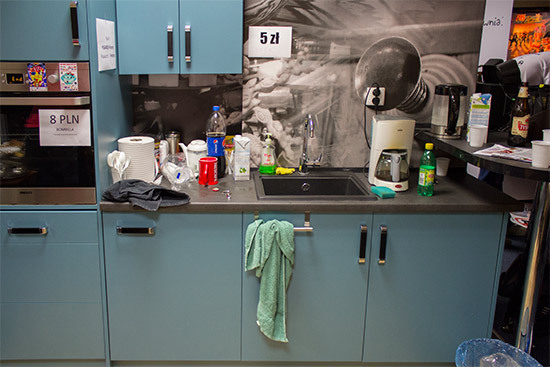 Bottles of Pepsi, along with filter coffee and a kettle with tea bags were all provided at no extra charge, while 500ml bottles of lager cost 5 Polish Zlotys (€1.16/$1.27/£0.90) each. ECS Players had to register and pay in advance so that on arrival they could sign-in and collect their welcome pack. 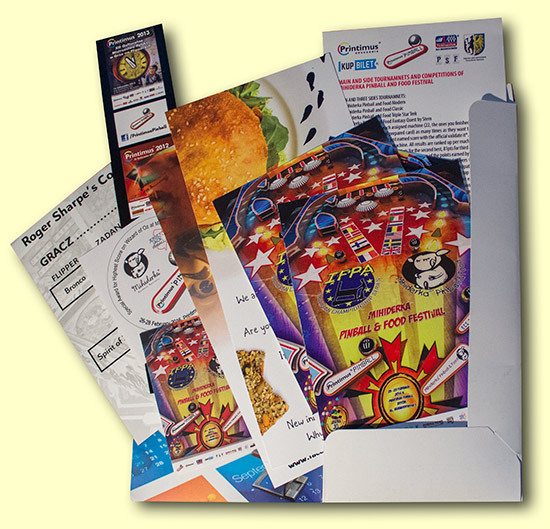 This included information cards on Printimus Pinball and Mihiderka, a sticker, a fridge magnet, a card detailing the rules of the tournaments, an entry to the Roger Sharpe Contest, a bookmark, and tokens for three meals. The main ECS final began at 09:30 on Saturday morning when the 32 players were paired-up and played a best-of-seven match. The highest seed chose the first machine but also had to take the player one position. Thereafter, the machines were chosen by the loser of the previous game. The sixteen winners continued on the right side of the bracket, while the same number of losers moved to the left to play each other in best-of-five rounds. Eventually the survivor of the winner side would play the winner of the loser side in the final. 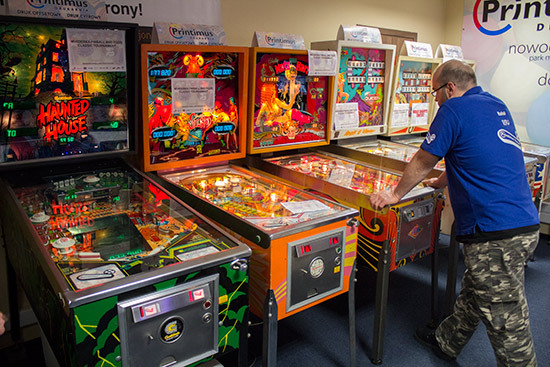 Twenty-two machines were available to play. 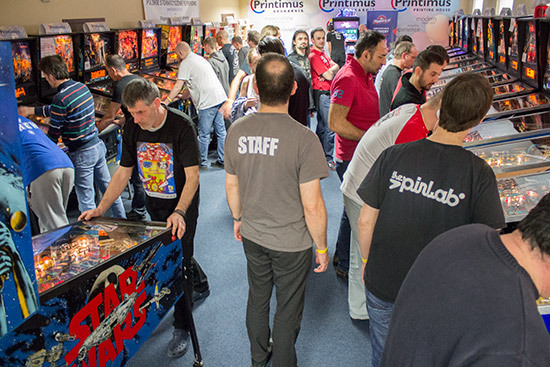 The vast majority were Williams/Bally dot-matrix machines, with a couple of alpha-numerics, a Pinball 2000 and a Data East machine completing the line-up. Before play began on Saturday morning there was a moment of silence to remember Edy Flammer, who passed away on the 7th February 2016. 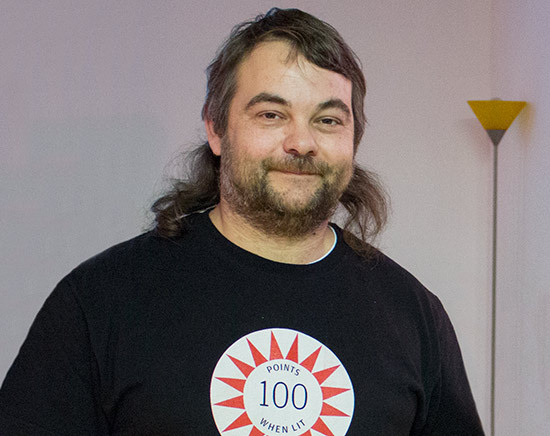 Edy was the gracious host of last year's ECS 2014 final held in Switzerland at the venue in Kollbrunn named after him - PinballEd. Everyone honoured his memory and marked his passing with a moment of reflection, before this year's ECS final began. 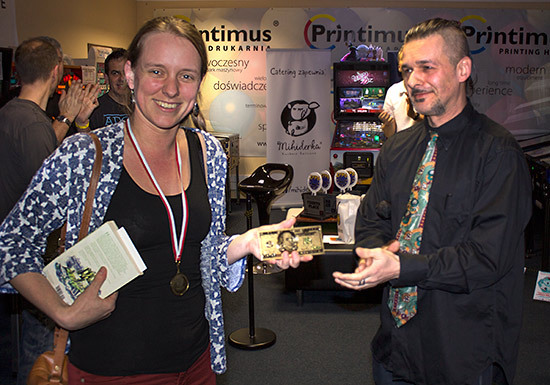 Starting on Friday and continuing on Saturday, running alongside the ECS final, was the Mihiderka Modern Tournament. 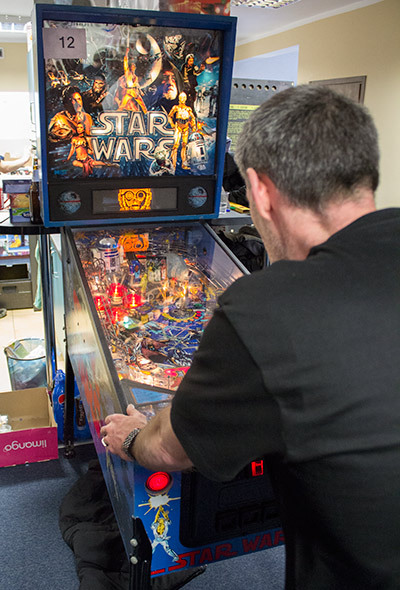 In this, players could play as many games as they liked on any of the twenty-two machines. When they got a score with which they were happy they could get it recorded on their score sheet. Once recorded, the score was locked-in and couldn't be changed for a better one. 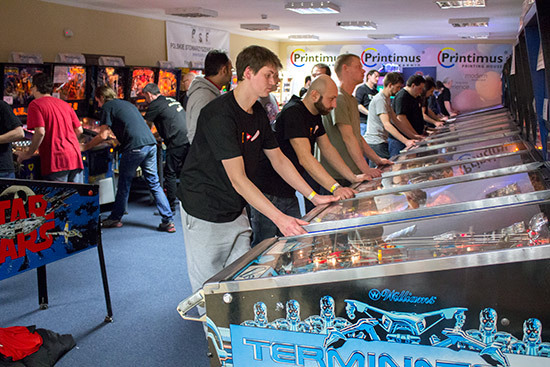 With twenty-two machines and unlimited games, there was a lot of concern by players that they would be able to get a decent score on each machine before the close of qualifying at midnight on Saturday, especially with the ECS final and other side-tournaments in which to play. 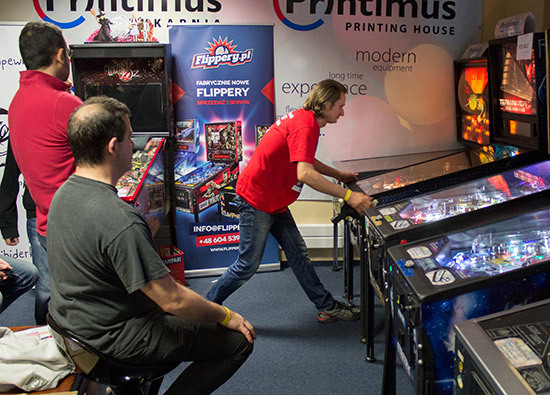 The scores on each machine were ranked, and the total of their ranking points made up a player's overall score. We've mentioned the side tournaments before, so let's take a look at those. Players could buy as many entries as they liked at 5 Zlotys each, where each entry was a run of three games. However, only the last entry submitted counted. Scores were then ranked and the eight players with the most ranking points from their last entry went into the quarter-finals on Sunday. If a bad game ruined a prospective run of three scores, an entry could be torn up and not submitted. The second side-tournament was the Mihiderka Fantasy Quest by Stern, featuring four fantasy-themed Stern machines. 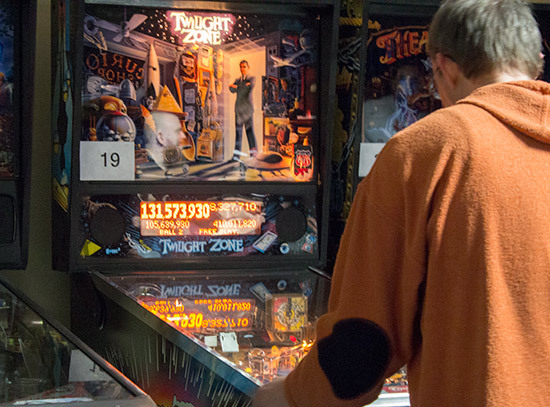 Contestants had to choose three of the four machines and record scores on them. 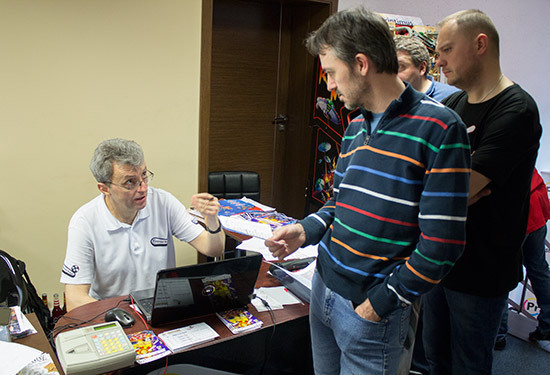 The same rules about unlimited entries and only the last entry submitted counting applied, as in the Classic Tournament. 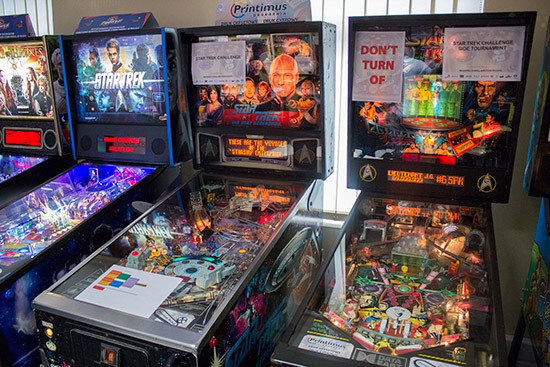 Next came the Mihiderka Triple Star Trek Challenge tournament, played on three Star Trek machines - one shared with the Fantasy Quest Tournament. 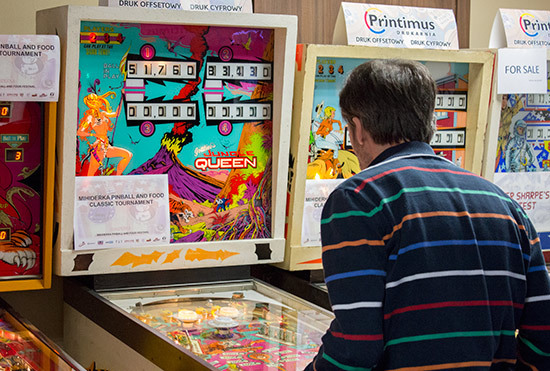 In this one, two of the three machines were played with each entry, but the rules were otherwise the same as before. 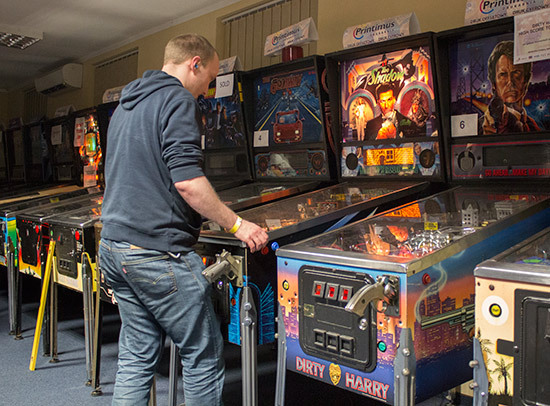 There were also high score tournaments held of Dirty Harry and Johnny Mnemonic. These were free and included any games played in the tournaments. 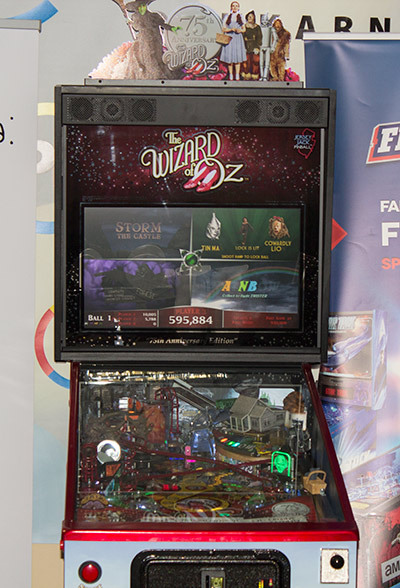 A third high score tournament was run on The Wizard of Oz, although this was pay-per-play. The ECS final was expected to finish on Saturday, but the last remaining matches were played on Sunday morning. 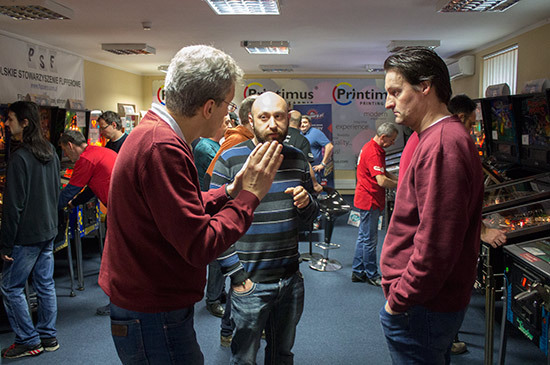 They were interspersed with the play-offs for the Mihiderka Modern Tournament. In these play-offs, the top sixteen formed the A-Division where they played a total of fifteen head-to-head games - one game against every other player in the division. When all the games were complete, the four players with the most wins would compete in a final. The next sixteen players formed the B-Division and did the same for 17th-32nd places, except there was no final. The choice of machines was a little more convoluted. 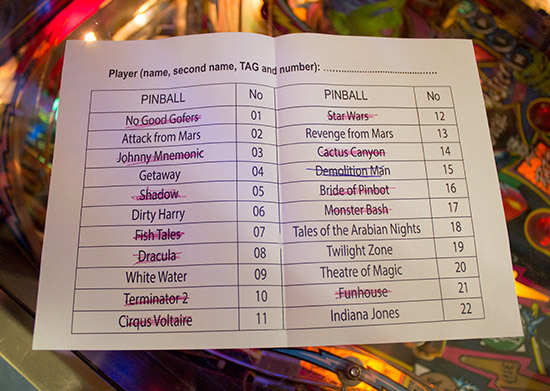 Each player was given a sheet listing all the machines and asked to delete all but nine of them. These nine machines would then be the player's choices. In the first round the highest seed got to pick the machine, which they then crossed-out on their list. 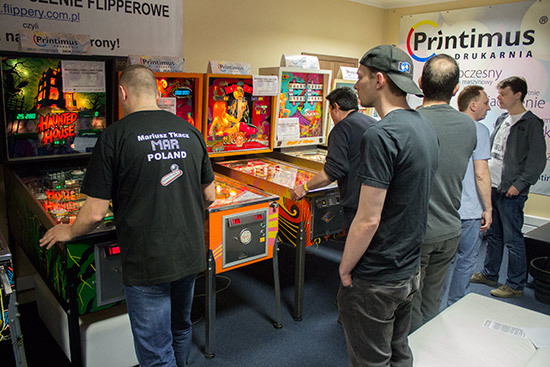 After that, the player with the most remaining machines got to choose, or the highest seed if they both had the same number of machines remaining. 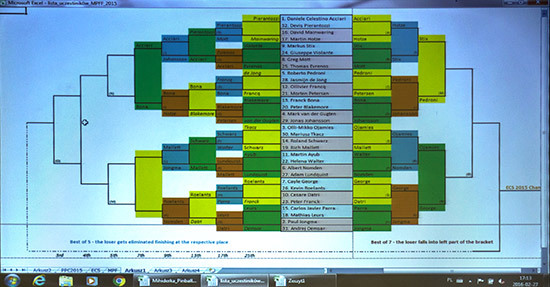 The pairings in each round were shown on the projectors - one for the A-Division and another for the B-Division. 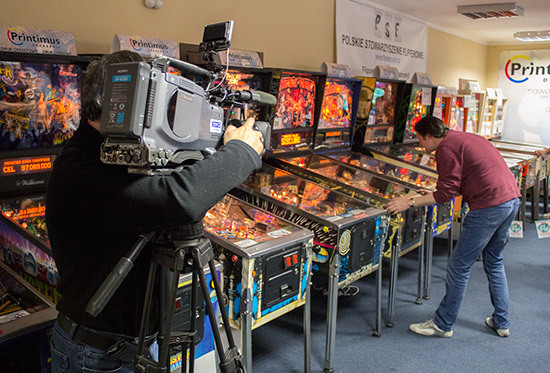 During Saturday, three TV crews were filming the competitors, and holding interviews with organiser Łukasz Dziatkiewicz and some of the players. 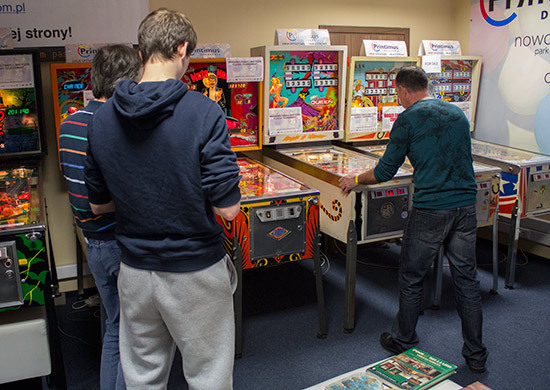 Some of pinball's ancestors and spin-off games were also on display both for the players and for the cameras. 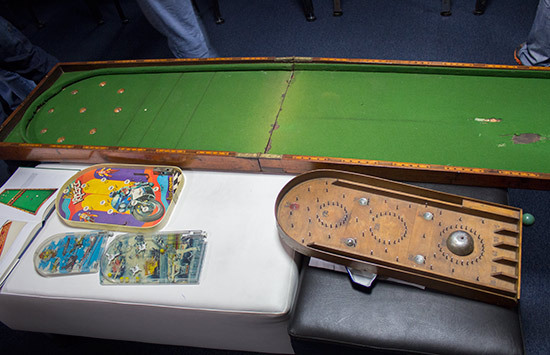 The large bagatelle game is the same as the one featured in the accompanying pinball book. Markus Stix remained undefeated to win the winner bracket, setting up a match against loser bracket winner, Cayle George, in the overall final. With so many other tournaments also taking place on Sunday, there was little fanfare for the ECS final. 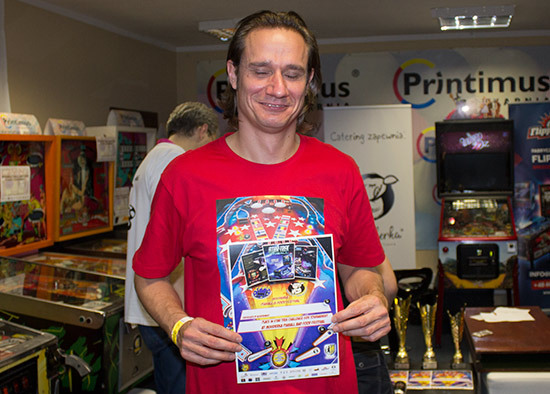 In fact, it was over before we were aware it had begun, but it was a victory for Cayle as he won the match four games to one, making Markus second. 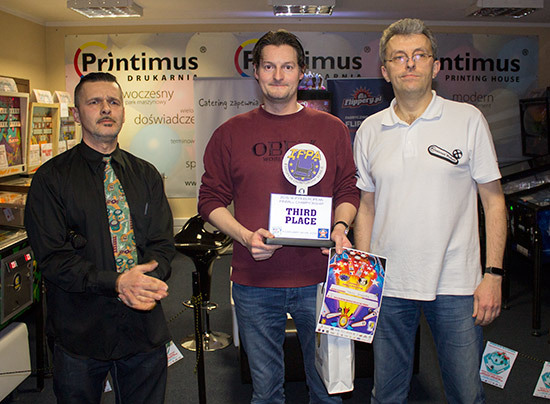 In the semi-final of the loser bracket, Cayle had defeated Paul Jongma, who in turn had defeated Daniele Acciari, putting them in third and fourth places respectively. 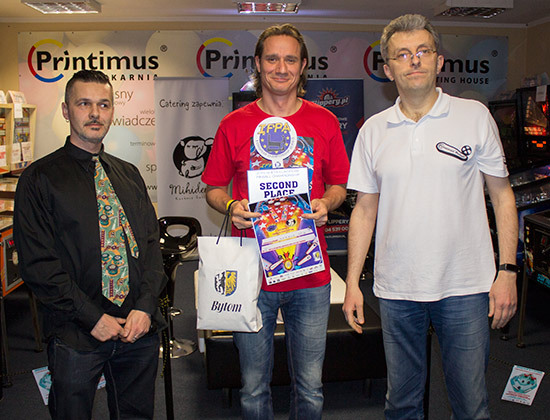 Trophies, certificates, Techland computer games and prize packs from the Mayor of Bytom were presented by Łukasz and Marcin. 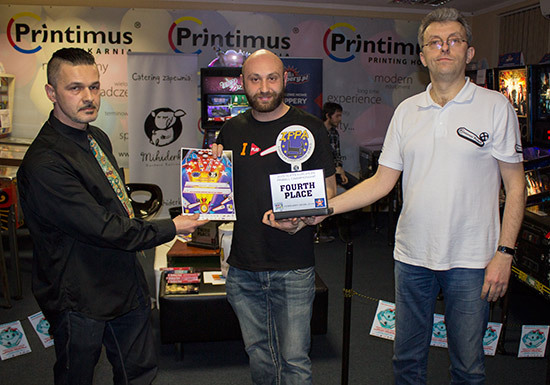 In addition to the trophies and prize packs, there were also cash prizes of €768 ($845/£593) for first place, €576 for second, €384 for third, and €192 for fourth. There was also an award of a golden $100 bill for the most stylish player, as voted by the other players. 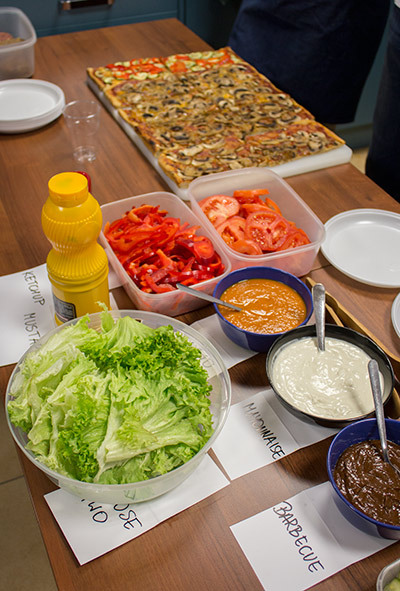 The winner was Jasmijn de Jong. Interspersed with all the other competitive events, the final rounds of the Classic Tournament were decided early on Sunday afternoon. The top twelve from the qualifying round made it through to the play-offs, with the top four earning a bye into the quarter-finals. All four best-of-five first round matches were won 3-2, with Cayle George, Franck Bona, David Mainwaring and Peter Blakemore going through. Of those only Franck continued into the semi-finals, where he was joined by Ollivier Francq, Daniele Acciari and Carlos Javier Parra. Franck and Daniele went out in the semis, setting up a final between Ollivier and Carlos. The winner was decided by a game on Jungle Queen where, by the end of ball four, Carlos was leading 83K to 51K. Ollivier needed an impressive last ball to save the match, but unfortunately it was not to be, making Carlos the winner without him needing to play his fifth ball. In a play-off, Franck took third place and Daniele fourth. Daniele had a private bet with Marcin on the outcome of the tournament, a bet he lost meaning he had to shave off his beard. 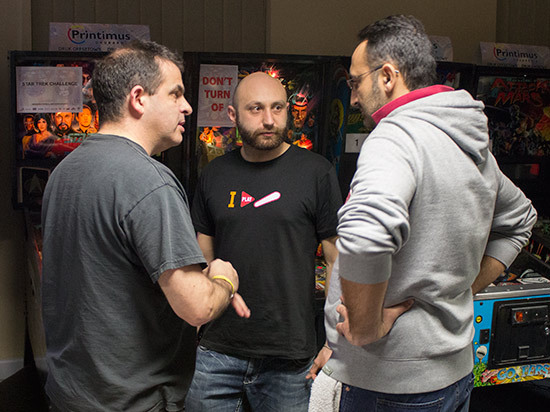 As the evening turned into the night, the last of the remaining matches in the Mihiderka Modern Tournament play-offs were completed, leaving the last four to contest the final. 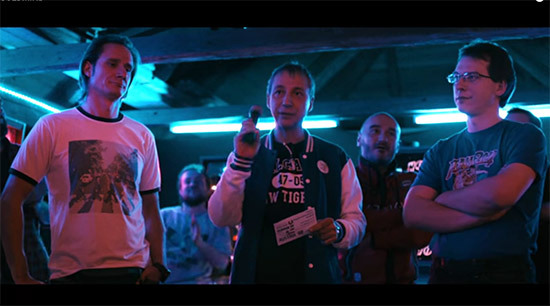 Before that, there was an interlude during which players enjoyed the first screening of a new music video based around pinball rivalries, featuring Austrian players Roland Schwarz and Markus Six. Then it was back to the serious business of the final. Each player picked a machine and took the player one position. The remaining positions rotated through the four games and 4, 2, 1 and 0 points were awarded for the final positions in each match. 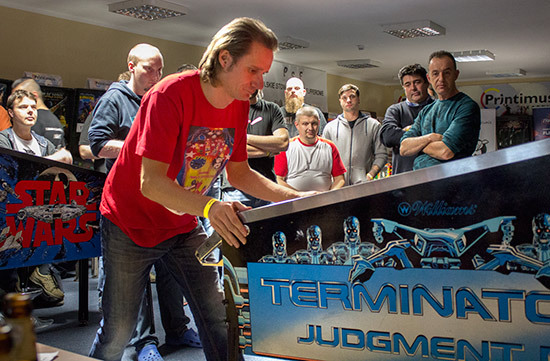 Markus began the final with his pick of Terminator 2. It was a good start for him with 41M on his first ball, but Daniele edged ahead with 52M. Albert has a bad first ball, scoring just under 2M while Olli-Mikko in the player four spot ended a little shy of 20M. Markus, Daniele and Olli-Mikko all added around 15M to their scores on ball two, while Albert's luck didn't improve much as he lagged on 4.2M. Markus has similar luck on his third ball to end on 59M, behind Daniele who boosted his total to 88M to take first place. Albert did a little better but only scored 9.7M in total, but Olli-Mikko improved his score to 63M to take second place. Play then moved on to Daniele's choice of No Good Gofers. His choice proved a good one, as his first ball total of 22M was a long way ahead of the other three who all scored around 7M. Ball two just accentuated Daniele's lead, with his 73M still well ahead of Albert's 21M, Olli-Mikko's 9M and Markus's 11M. The only one not to add 2M to their total on their third ball was Markus, who had an impressive ball to take second place with 59M. Daniele was the winner, Albert was third and Olli-Mikko fourth. 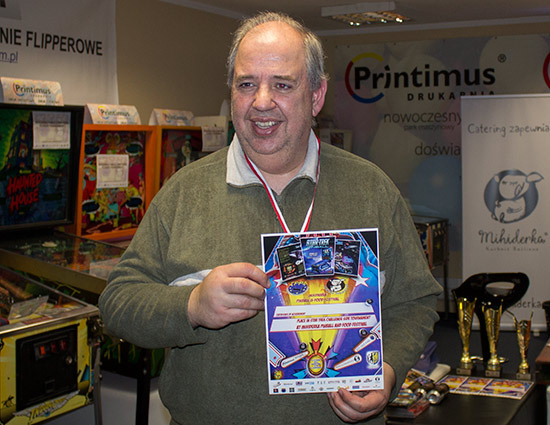 The third game was Twilight Zone which was chosen by Albert, although he must have wished he'd picked a different game after Daniele scored more than 410M on his first ball thanks to a 320M+ Powerball Mania. That said, Albert's 131M was enough for second place after ball one. That changed with balls two and three, where his 143M total score dropped down to fourth place, as Olli-Mikko had a nice last ball to take second with his 407M, and then Markus moved up to third with his 223M. All the while, Daniele piled on the points with each ball, to score a third win with his 1.42B. 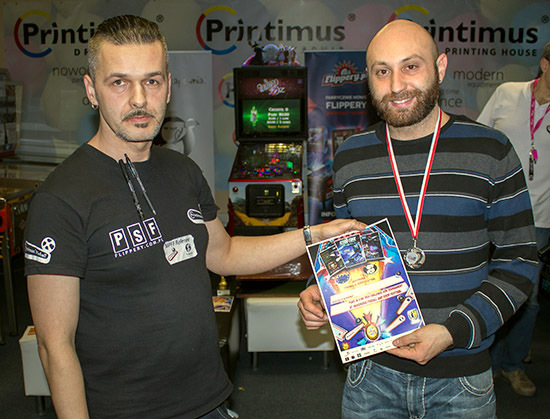 With twelve match points in the bag, Daniele was assured of first place. Markus and Olli-Mikko both had four points (although Olli-Mikko carried one more win than everyone else from the play-offs round into the final, so was actually on five points), while Albert only had the one point. 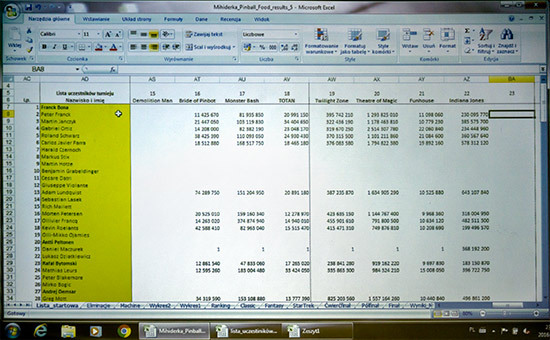 Olli-Mikko's selection of The Shadow would decide the second, third and fourth places. He began well, with more than 900M from ball one. He boosted that to 1.23B by the end of ball three which was enough to take the win and give him second place overall. 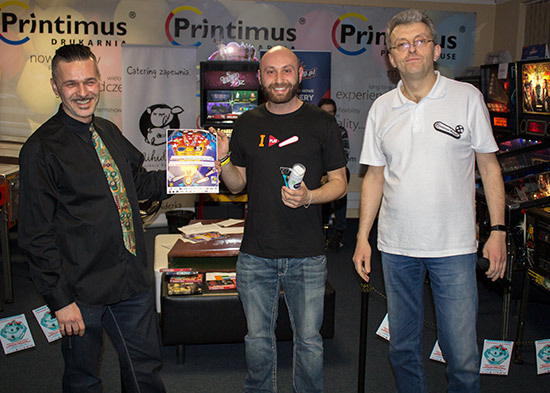 Albert's 545M took second place in the last game, while Markus's 327M gave him third ahead of Daniele's 161M. 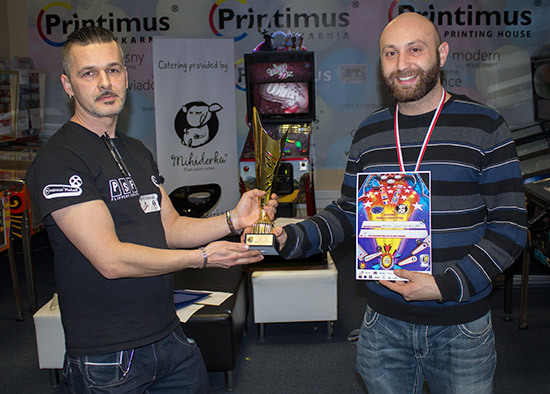 So Daniele won the Mihiderka Modern Tournament, Olli-Mikko was second, Markus third and Albert fourth. Cash prizes were also awarded to the top four. 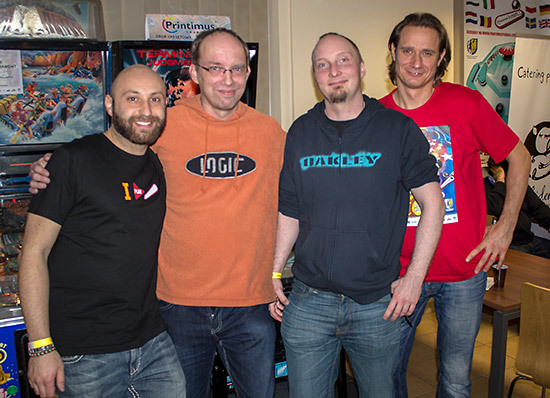 Daniele won €250, Olli-Mikko €125, Markus €65 and Albert €35. 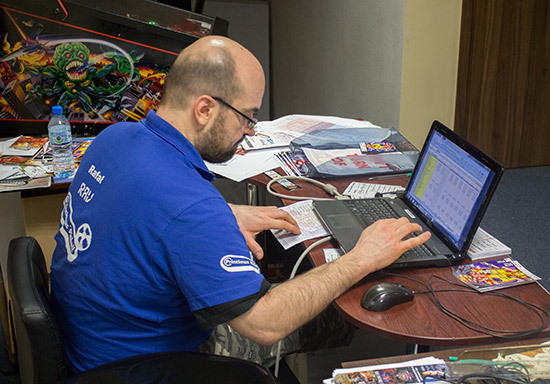 It was nearly 1am by the time the Modern Tournament was concluded, but there were still two more competitions to be decided - the Fantasy Quest and Star Trek tournaments. 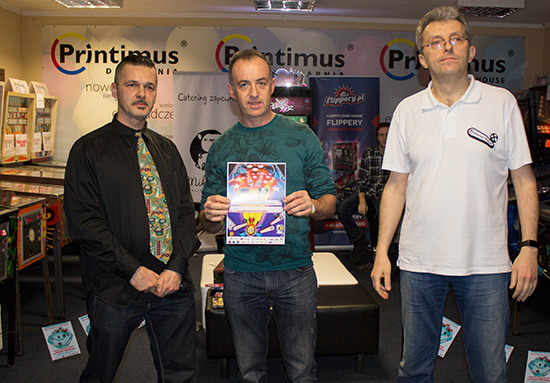 The Star Trek Challenge was the first, with Daniele Acciari and Cesare Datri the two finalists. 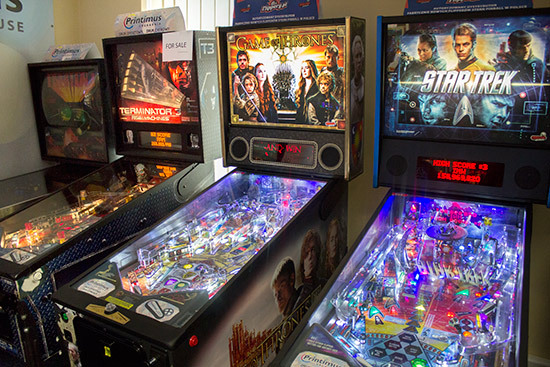 The three machines were played left-to-right in the best-of-three final. Cesare won the final 2-1, with the player who played second winning each of the three games. 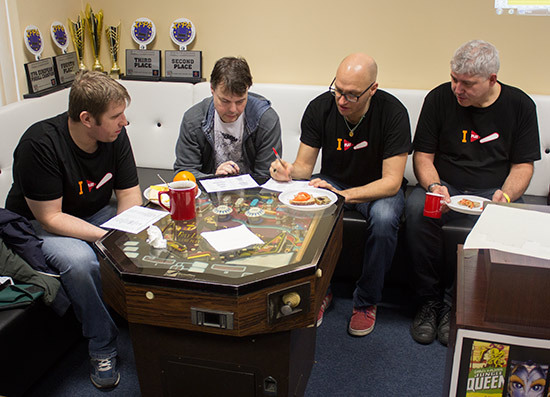 At 01:25 the final round of the Fantasy Quest by Stern tournament began. Markus Stix and Cesare Datri were playing, starting on Terminator 3 and moving along the line. Orbitor 1 wasn't used in the final. 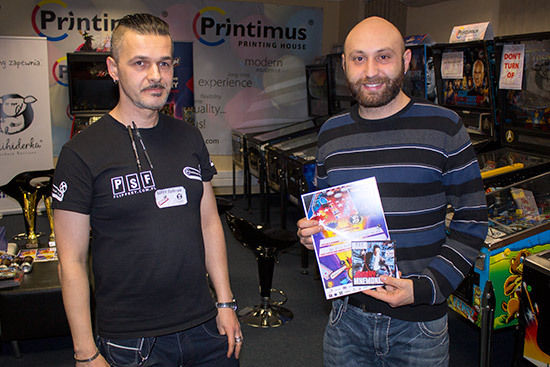 Markus won on Terminator 3 before Cesare levelled the score by winning on Star Trek. 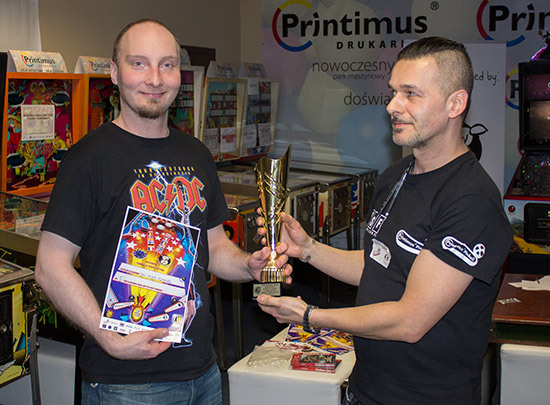 Game of Thrones was therefore the decider, and it was Markus who triumphed to win the tournament. Jonas Johanssen was third and Carlos Javier Parra fourth. In the high score competitions, Devis Pierantozzi achieved the highest score on The Wizard of Oz. 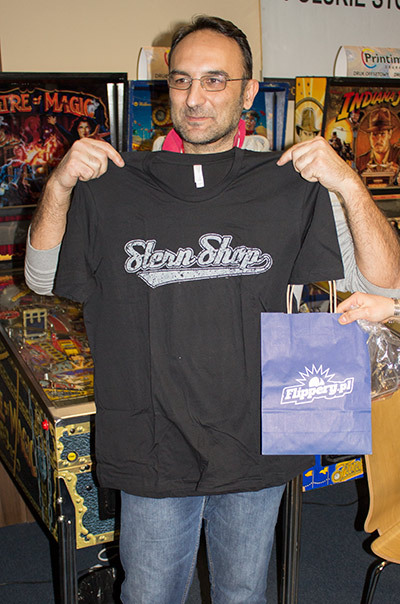 Devis won a flyer for the game signed by Jack Guarnieri, along with additional flyers for the same game and The Hobbit. 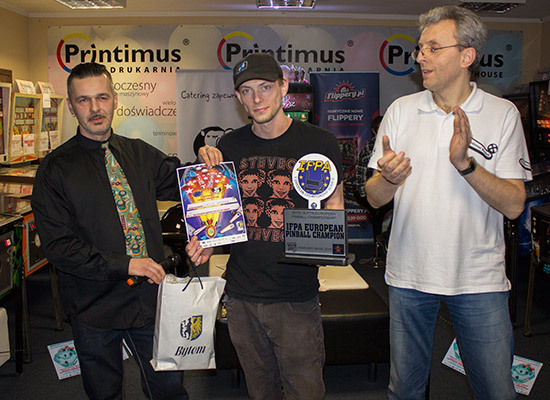 The Johnny Mnemonic High Score Competition was won by Daniele Acciari. Daniele's 34BN score won him a DVD of the movie. 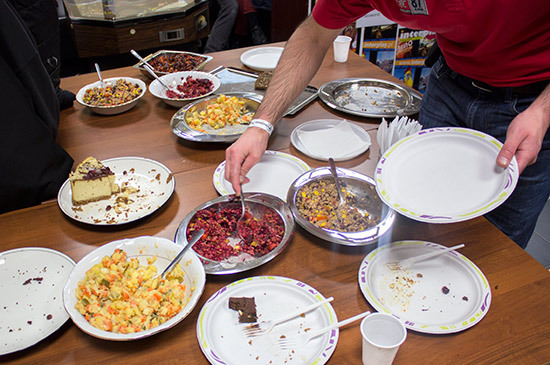 And so, just before 3am, all the tournaments had been decided, the trophies and prizes awarded, the machines switched off, the players had left, and the ECS Final and Mihiderka Pinball & Food Festival came to an end. Even with the long hours, it had been a packed three days of playing competitive pinball and discovering new types of vegan food. 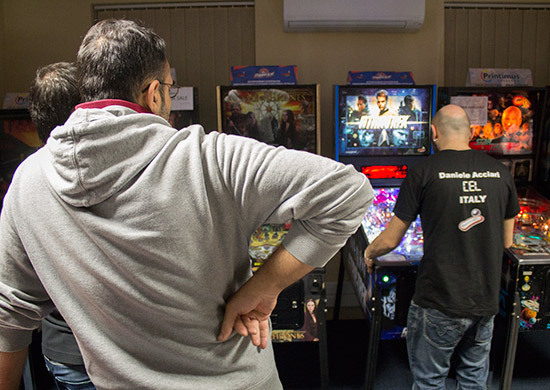 Łukasz, Marcin and Mirek worked tirelessly in the run-up to the event and then all weekend to make sure all the players understood the rules, had any problems resolved, and got to enjoy themselves. 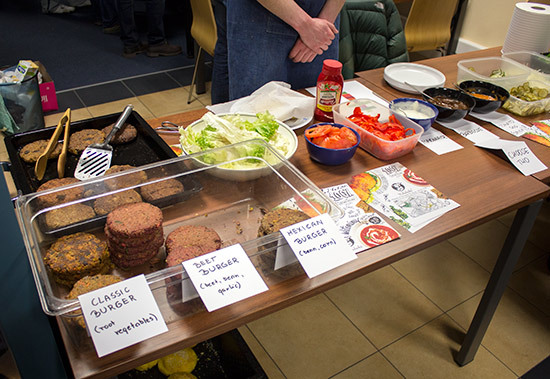 And while we're not about to convert to veganism any time soon, everyone surely left with a greater appreciation of the tasty dishes possible when only using plants as the ingredients.